A complete MBA level strategy & consulting guide at your fingertips! "The cards distilled volumes of concepts into a concise, potent medium for learning and remembering. Interview preparation with these cards was definitely a contributing factor to my landing a job at a top consulting firm." 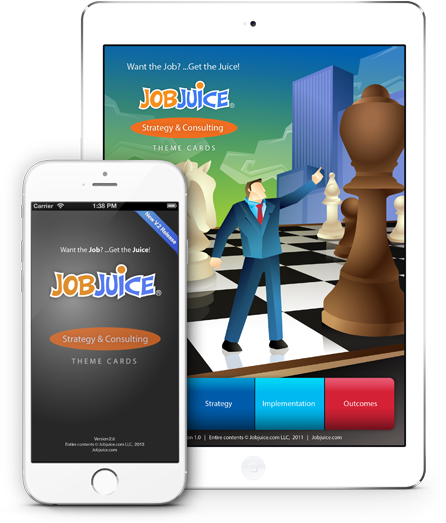 The Strategy & Consulting App is a powerful reference guide and job interview preparation tool. Access over 80 cards filled with strategy concepts and frameworks for company diagnosis, strategy definition, implementation and results. Review strategy on the bus, in a meeting, at lunch, in class…anywhere, anytime. Create your own groups of cards by topic or interview question.